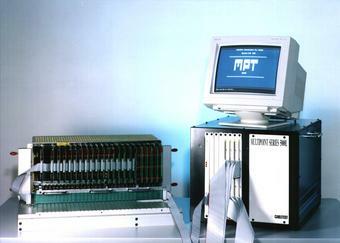 Distributed test system developed specifically for backplanes capable of testing over 30,000 points. This uniquely designed tester has the ability to mix high voltage testing for power and ground circuits with low voltage testing of signals. Connection to the backplane is through customized paddle cards that either CableTest or the customer can build. The distributed switching card is a separate, small assembly that plugs directly into the paddle card. Several distributed switching cards can plug into a single paddle card as required. The distributed low-voltage switching is connected on an open loop, flat ribbon daisy chain back to the Multipoint controller. The system is capable of continuity and insulation testing at low voltage from 0.2 ohm to 400 Kohm in two-wire or four-wire mode. In addition, components such as resistors, diodes, capacitors and transistors can be easily tested. The system operates using the proven software, developed by CableTest, that also controls its MPT high-voltage wiring analyzers. Automatic programming from CAD is also available.